Puuluup is a duo from Estonia – Ramo Teder (Pastacas as a solo artist) and Marko Veisson. A pinch of surrealism, modern folklore and talharpa revival. The old and the new stick together like water and sleet in Puuluup’s oeuvre. The instruments – talharpas – represent tradition and folklore. The characteristically susurrus sounds of these instruments are sent through effect blocks and a looper. The lyrics and melodies are a mixture of our musical memories and improvisation. Inspiration is often drawn from leiks from Vormsi, Finnish jouhikko repertoire, Sahel’s blues, chastushkas and other elements from the musical traditions from around the world. All kinds of random sources of inspiration are similarly important – unexpected excerpts from Polish TV series, old Estonian punk and sweetbread from Vormsi Island. 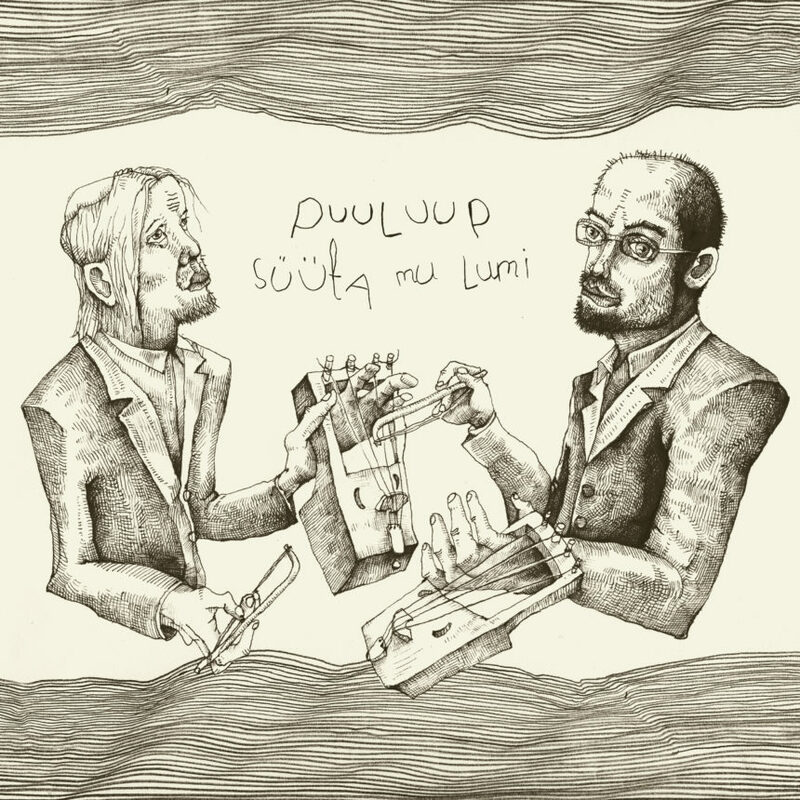 “Süüta mu lumi” is Puuluup’s first album. All arranged, recorded, mixed and premastered 2015-2018 by Ramo Teder in Teijo, Finland. Mastered by Margus Löve, Sudu Mastering; vinyl cut by Arnold Kasar, Calyx Mastering. Album cover’s drawings and handwritten texts also by Ramo Teder. Estonian Music Awards 2019 awarded the record as a Folk Album of the Year.